The biggest transformation in exam management is conducting exams through online, this is the easy way of making exams compared to pen and paper mode. While in paper and pen mode of examinations the students, examiners, management need to face crisis like question paper leakage, and others. The online computer based exam software “SimExams” an assurance of making secured exams, one can take the exam with ease. This application is developed with synchronized performance to make user gain knowledge regarding the subject. This software is developed for Desktop, Android, and iOS. 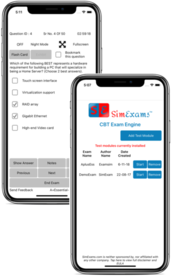 Exam Engine allows the user to import exams created using CBT Author Engine and configure exams according to their needs. Support different question types including Multiple choice single answer and Multi Answer, image, audio, and video. Bookmark questions and review them anytime.